This wall-mount locking payment drop box, Model USSDL-500, is designed for inter-office use. (Can also serve as desk-top.) The perfect way to lock and secure suggestions, ballots, keys, mail, money, rent checks and more. Features: tubular-style key lock with double "D" configuration (can be retrofitted with other cam locks); heavy-duty internal hidden hinge, slot opening - 12-7/8 wide accepting large envelopes, metal baffle to protect slot, pre-drilled mounting holes - bottom and back, mounting hardware for wood and concrete included, 2 tubular keys, reinforced door, can be installed on a wall or on a desktop, top compartment to store envelopes, durable powder coat finish. Specifications: exterior dimensions - 15" W x 13-1/2" H x 11-1/4" D; door clearance - 12-1/8" W x 4-3/4" H; drop opening - 12-7/8 W x 1/2" H; door thickness - 1/8"; cubic inches - 313; weight - 23 lbs. 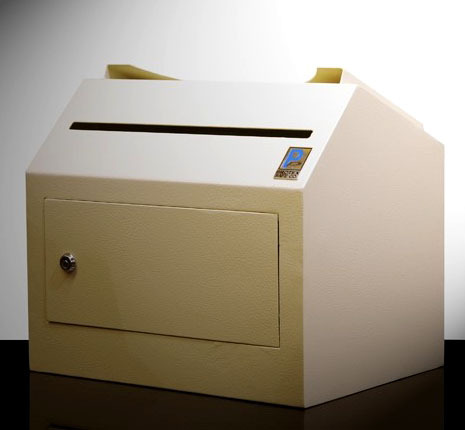 This wall-mount locking payment drop box, Model USSDL-500, is designed for inter-office use. (Can also serve as desk-top.) The perfect way to lock and secure suggestions, ballots, keys, mail, money, rent checks and more.